We have left Tampa bay and we rolled east towards Lauder Hill, which is 30 minutes away from Miami. Adry’s aunt and uncle were nice enough to let us borrow their Condo. This means for us 3 more nights sleeping in a real bed with the AC. It also means to possibility to eat some real meals and to cook in a real kitchen! We took a little night off, stayed there and relax because we had a big planning for the next day. 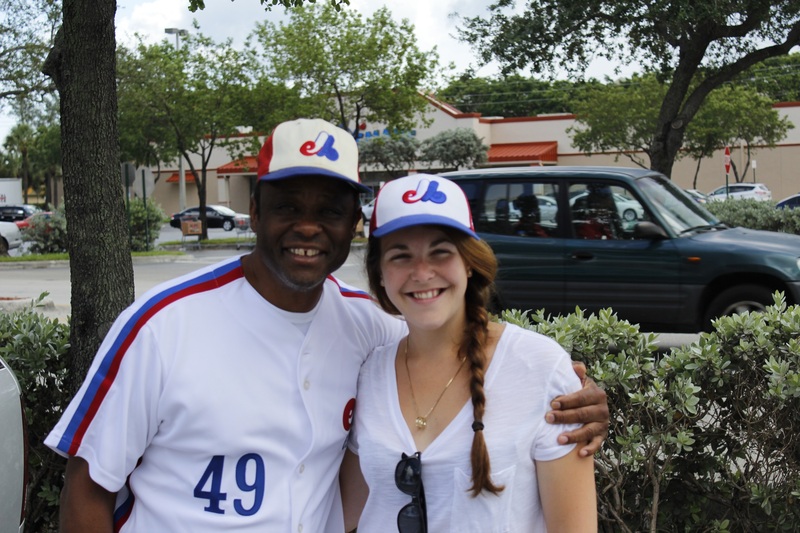 In the morning, we met up with Warren Cromartie, a former expos player. He played for the Expos from 1974 to 1983 before heading to Japan and to finally retire in 1991. He played with Ellis Valentine and future hall of famer Andre Dawson. ‘’Cro’’ (his nickname), was a high figure for all the Expos fan and he was sadden like all of us when the team left in 2004. He now works for the group Montreal Baseball Project, which works really hard towards bringing back a Major league baseball franchise in Montreal. He is a great as a spokesperson and you must have heard him talking to the fans before the pre-season games in Montreal earlier this year. Cro really wanted to meet us to encourage us on our trip around the United States. A few minutes after we met him, we started to talk about our car problems. He seemed really worried about that so he took the time to call on his mechanic friend, Joie, who came up to check on our car. We were unlucky, the compressor needed to be repaired. It was the reason why our AC stopped working a few days earlier. We had to get it repaired before we leave for Texas because it wouldn’t have been safe to keep travelling with this compressor especially with all the mileage we plan to do. 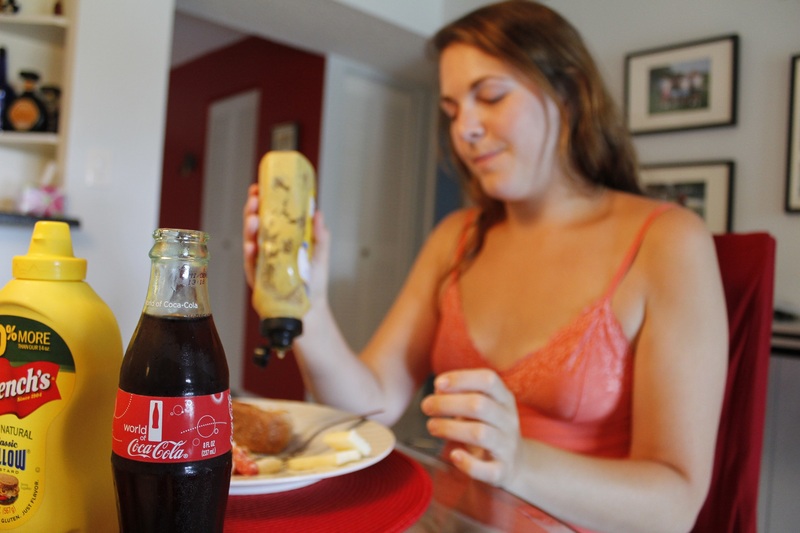 Hopefully, Joie’s family: Amy, Dylan and Amanda took care of us while Joie and his son Holden were working on our car. We visited a farmers\flea market, rode in the pick-up box, talked American politics and learned a Floridian dice game! After that Amy dropped us at Hollywood beach. We could relax a few hours and take advantage of the sun and the hot water. Joie and his family were really nice to us, they took the time to take care of us and made sure we would leave with a safe car. How about that Floridian hospitality! A big thank you to you guys from us back on the road! Unfortunately, the car couldn’t be ready on the same day so we had to figure a way to get from Lauder Hill to the Marlins Park in Miami on the next day. Luckily, we were supposed to meet up with Jeason Gagnon at the game. 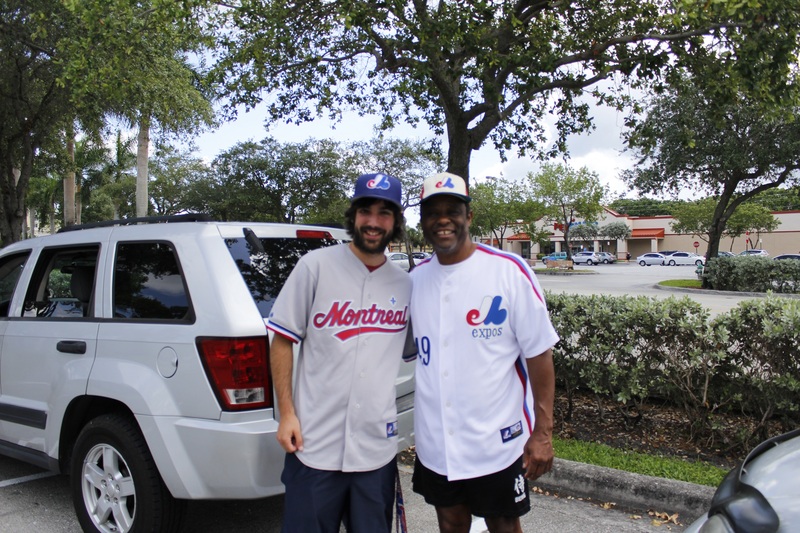 Jeason lives in Fort Lauder Dale and he is a big Expos fan! 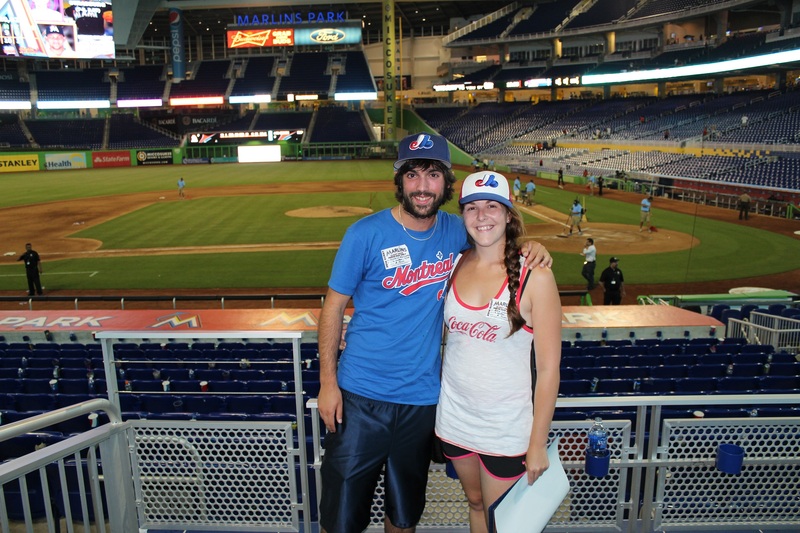 He grew up in Florida but spent his summers in Montreal with his family where he attended many ballgames! 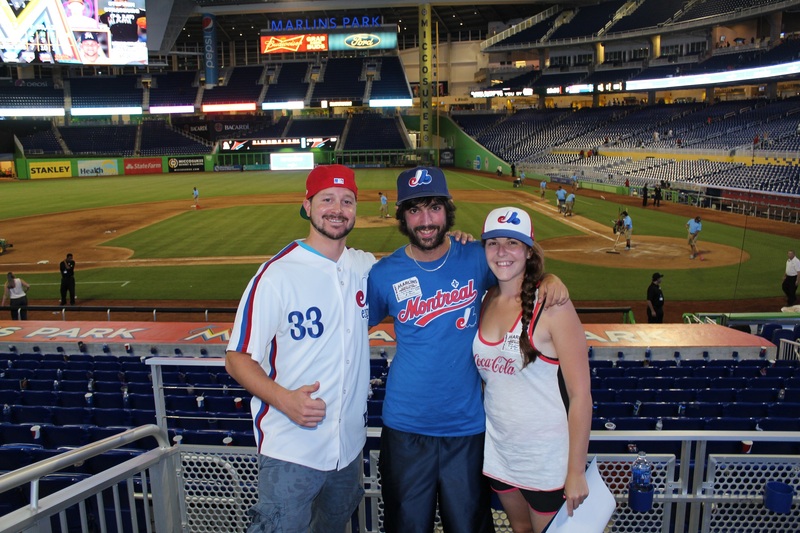 The three of us shared a lot of memories from the Expos and the Big O. Like us, Jeason strongly believe that baseball will be back in Montreal. He was nice enough to come and pick us up to drive us down to Marlins Park on game day. 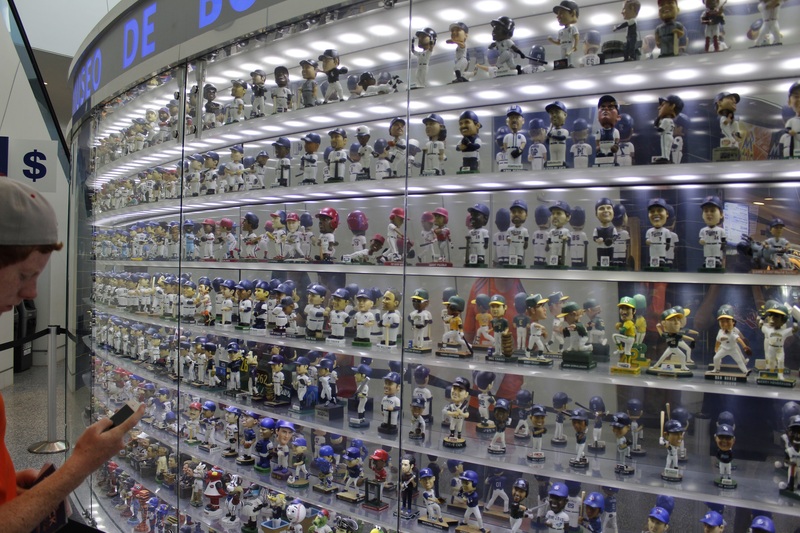 Jeason gave us a tour of Marlins Park. 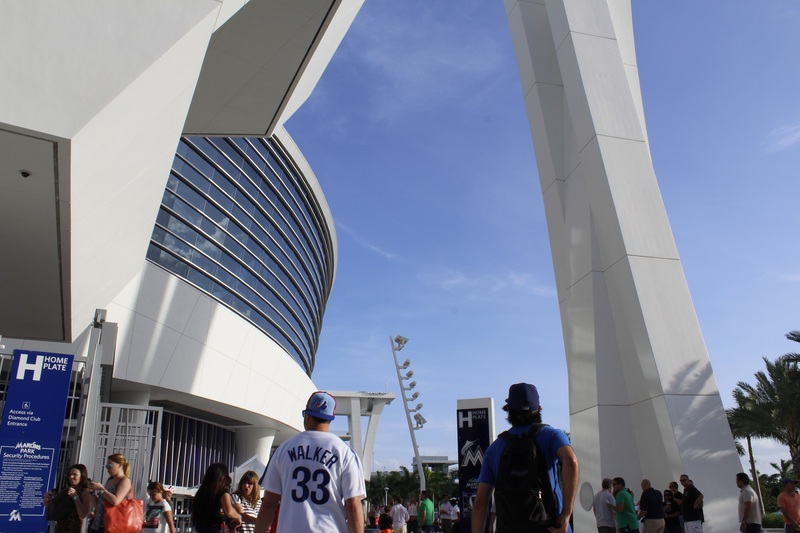 From the outside, the ballpark has a really modern look and we were impressed by that. It really didn’t look like any of the ballparks that we already have visited. 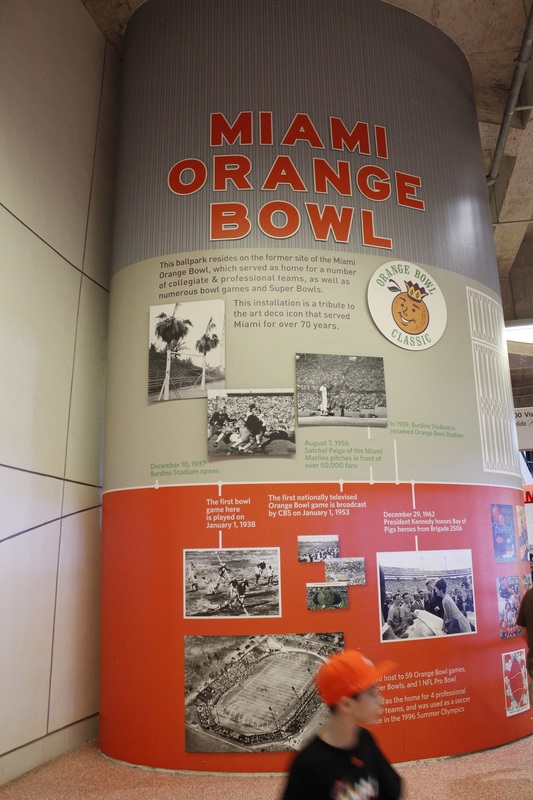 The ballpark has been built where the famous Miami Orange Bowl was. This stadium was host of the Orange bowl until 1995 (they had the last one in 1999). It was also host of 5 super bowls. Inside Marlins Park, there is a timeline showing the history of it. Marlins Park has a retractable roof so games can be played if it is raining or if it’s too hot. Last night has too hot and the roof was closed. Jeason told us that the roof was closed most of the time. It’s too bad because when it’s opened, you have a nice view of Miami in center field. We both also like it better when the game is played in open air. When getting in the ballpark, we realized that this pretty young park (2012) was well designed. The huge bay windows next to the center field let the sun come in even when the roof is closed. Like many ballparks, there is a promenade that you can walk around the whole ballpark and still see the game. Too bad for us, the upper deck was closed for this game (the upper section of the bleachers was) so our visit of the park was kind of quick! We still could find some great attractions in the ballpark to make sure the fans are satisfied: All you can eat section, Kosher food restaurant, the bobble heads museum, a huge bar in left field with a view directly on the field (the Clevelander) and a big sculpture with Marlins that light up for home runs and after a Marlins win! To conclude about the ballpark, yes it is modern but it’s also simple. They tried to compact all the fans on the lower tier so the park doesn’t look empty. There were 20,000 fans when the capacity is 37,000. Our tickets for the game were offered to us by Glenn Geffner who is the play by play announcer for Marlins Radio. Earlier in his career, he worked for the Padres and the Red Sox. 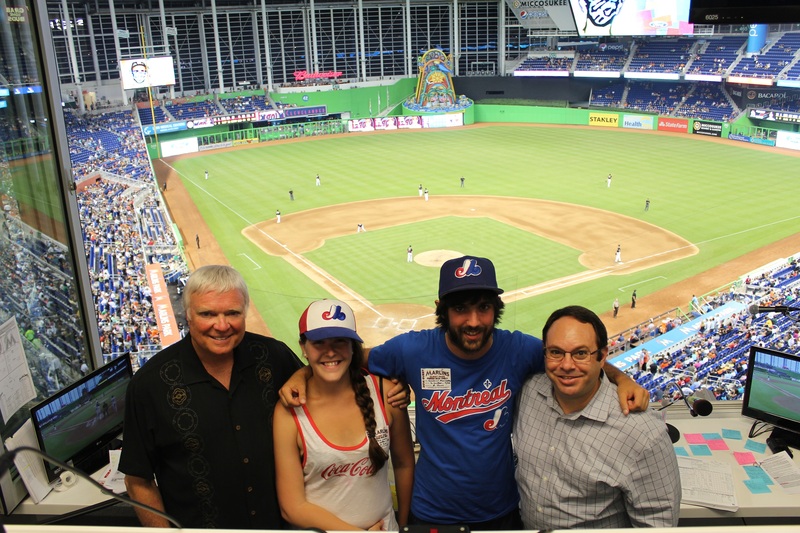 He wrote us really early when we launched our project so we could visit him and Dave Van Horne in Marlins Park. Dave Van Horne was the voice of the Expos for 32 years. He now works for Marlins Radio with Glenn. So it was a great honor for us to meet both of them on the Press gallery in their Radio booth. Glenn also got us really great tickets for the game: 4th row behind the Marlins Dugout. Great places close to the action! For the game we had a duel between the Nationals and the Marlins. Not the best matchup for Expos fans! The starting pitchers were Nathan Eovaldi and Jordan Zimmermann. The Marlins were on a hot streak coming into this game having only lost 1 game on their long road trip (we attended that lost in Atlanta!). The Nationals got the first point early in the top of the 1st inning. Marlins hitters couldn’t find a flaw in Zimmermann’s pitches. He got help from his team in the 6th inning: base hits from Bryce Harper and Jason Werth extended the Nats lead and it was over for Eovaldi. After a walk and another single, the Nats were leading 6-0 in the middle of the 6th. At this moment, we had to leave our seats to go on the press gallery to meet with Dave and Glenn. When we got up there, the Marlins scored 2 points in the 7th, another in the 8th after Zimmermann got pulled out of the game. The Marlins needed 3 points to tie the game heading into the bottom of the 9th. Marcell Ozuna and Jarod Saltalamacchia both got RBI’s bringing the score to 6-5 Nats. Ozuna tied the game when he scored on a big triple from Adeiny Hechavarria. Down to their last out with a man on third, Jeff Baker came to the plate and hit the first pitch away from the marlins fielder and Marlins would get the win 7-6! What a comeback! Between the innings, we got the chance to chat with Dave and Glenn. We asked them why the seats were empty in Marlins Park. Dave told us that Miami is an event city. People won’t come if the team is not performing well. Dave considers that the team is rebuilding right now and this is a big reason why fans don’t show up to the games. It takes more than a new and modern people to drag big numbers of fans to the ballgame. We both realized that the ballpark wasn’t putting everything out there to get the fans coming more to the games. Since the last championship (2003), fans slowly started to skip on games especially since a lot of players were traded. Also, like in Tampa, people prefer to stay home then having to get out in the heat to go to the ballpark. He also told us about baseball in Montreal. According to him, the return of baseball in Montreal is a possibility but Montreal is in a difficult situation: no ballpark, no team and no team, no ballpark. Furthermore, he ask questions: if a team is moving to Montreal, is that team going to sell the team or simply move and keep the ownership? Are Montreal and the fans going to accept to have American owners? Those are all good questions and we could see that Dave think that if baseball is to come back to Montreal, it must be done in the good way and not rushed up. Glenn told us about one of his memory from Montreal: He was working for the Padres when Tony Gwynn hit his 3000th hit at the big O. The team owner invited all the staff for supper at ‘’La Queue de Cheval’’ downtown Montreal. Glenn remembers the good food that kept and kept coming! 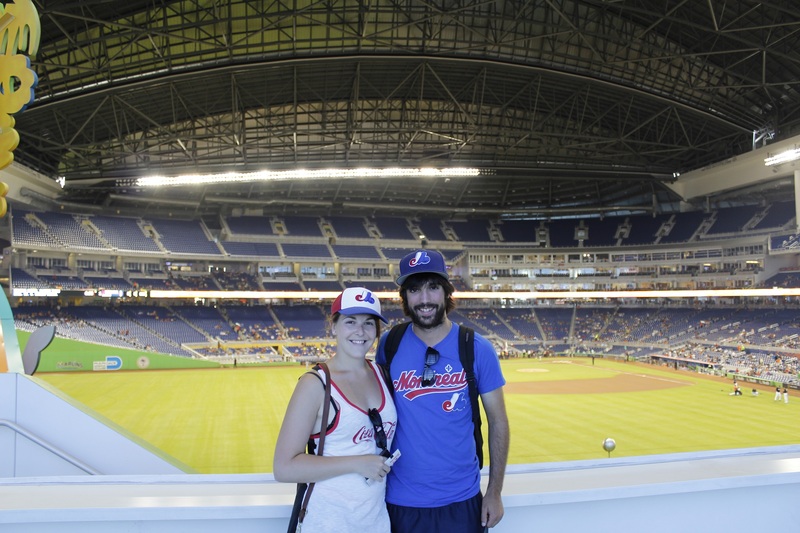 It’s nice to hear such good stories about Montreal from people working in baseball. We couldn’t stay after the game since we had to get back to Hollywood to get our car. Before we left, Alex, who’s working for the Marlins Media, interviewed us about our trip and gave us some Marlins gift to add to the collection! Big thanks to Glenn, Dave and Alex that gave us a memorable night at Marlins Park and we will remember that comeback for a long time! And like Dave told us, if there is one thing he learned with major league baseball: never say never! 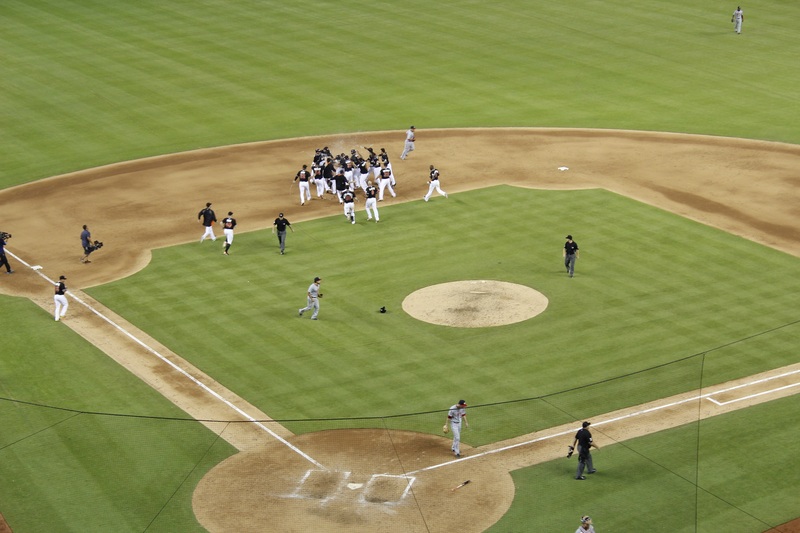 We had an awesome night at Marlins Park: we met very nice people, we saw a big comeback and we didn’t saw Jeffrey Loria! We still tough it was too bad the fan didn’t really showed up to the game even if they have a modern and new ballpark and exciting players like Giancarlo Stanton and Marcell Ozuna. 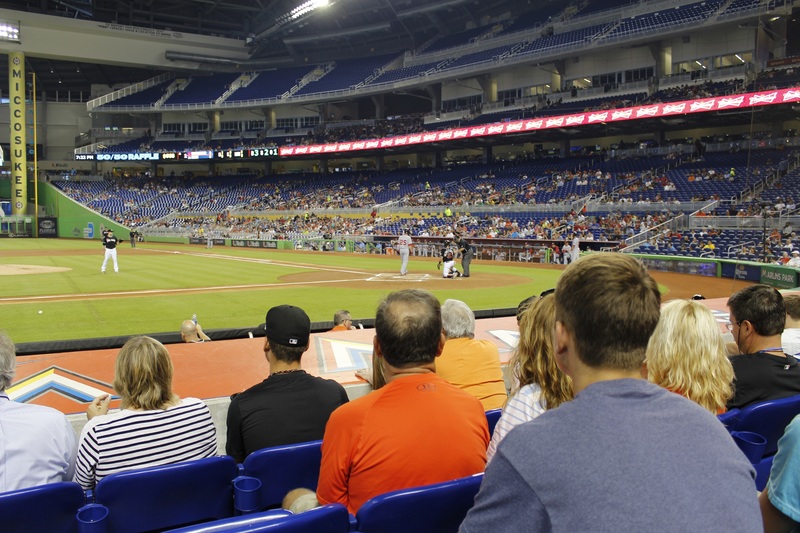 Baseball in Florida is struggling to get more fans to attend their games (Tampa in Miami are both in the bottom 5 teams in attendance average this year) and both teams need to find a solution. We talked with a Marlins fan in a gas station and he told us that the mistake was to build a ballpark in downtown Miami. People from the suburbs don’t want to go to the game because of the traffic jams. They would be coming home too late on weeknights and during weekends they have to take the whole day to get to the ballpark. We understand that problem and, in Montreal, when we’ll get a new baseball team, the emplacement of the ballpark will be a big decision. Finally, on departure day, we went back to see Warren Cromartie so we can say goodbye and a big thank you. Cro really likes and supports our project and it means a lot to both of us to get his approval. He’s a man with vision and he sees great thing for baseball in Montreal and we really hope to meet him again when he’ll come back for the preseason games in March at the big O (which should logically happen!). We give him a big thank you for his help. Also big thank you to Joie, Amy and their family for helping us with our car! Thanks also to Jeason for coming with us to the game. We hope to see you in Montreal for the preseason games in March as well so we can buy you a beer! Thank you to Christine and Jean-Claude for lending us the condo, we took good care of it! Finally thank you to Glenn, Dave and Alex for the game tickets, experience and chat on the press gallery and for the interview. This trip is still going because of people like them that give us the extra help we need to go 30 ballparks! Without them we don’t know where we could be right now! We love all you guys and we don’t give up! P.S. Did you know that Jarod Saltalamacchia has the longest last name in the MLB history! Not easy to fit his name on a jersey with the 14 letters! Thaks for your good word. I’m french speaking and I’m translating all the reports without any Google translate or dictionary while we are driving! I’ll be more carefull!